Some consider the individual retirement accounts (IRAs) as products that only allow deducting money from the income tax returns. This product is created as a long-term savings alternative, different from the traditional saving products available, helping you accumulate the necessary funds for your children’s education and preserve your lifestyle even after retirement. IRA accounts may also help you face an unexpected financial hardship. “Saving for retirement should be the main motivation to open an IRA. Obtaining a tax saving may be the second motive,” says Kurt A. Schindler, Ph.D., Financial Education Manager at Banco Popular de Puerto Rico. “The IRA is the tool, but the consumer must place the money for investment to help obtain an approximate expected yield. Products within the IRA include, for example, certificate of deposits, mutual funds and annuities,” Schindler says. Following is a table with the different fixed returns Popular IRA accounts, so that you may compare them and select the best one for you. For Schindler, the most important question you should answer is when you plan to retire. 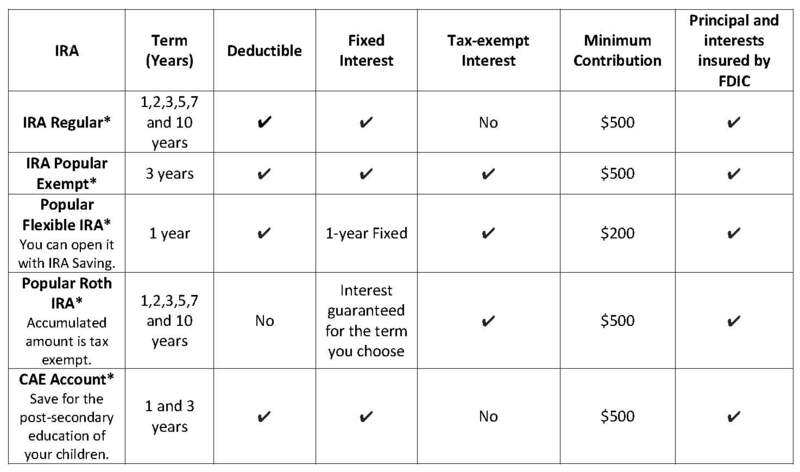 This will help determine the IRA you should select. If you still have to wait five years for your retirement, the best way would be to choose a low-risk IRA product from which the investment yield is obtained from certificates of deposit with a fixed interest guaranteed for its duration. The interest rate will fluctuate during the term of the IRA, but for Schindler, that should not be an excuse for not opening an IRA or make contributions to an existing one. “Always keep in mind that the purpose of the IRA is to accumulate funds for retirement through a secure instrument,” he says. Indeed, it is a secure instrument as long as you make a thorough evaluation with all the information available to make your best decision. We invite you to consult your financial advisor about the type of IRA account that best suits your needs. That way, you will be able to maximize its benefits. You can also access popular.com/en/ira for information about the different instruments available. *Penalties for partial withdrawal or cancellation: 1,2,3,5,7 and 10 year IRA Regular, and Popular Roth IRA and 3-year Popular Exempt; 180 days of interest; 1-year CAE, 90 days of interests; and 3 years, 180 days of interest. Penalties from the P.R. Treasury Department may apply in non-qualified withdrawals. Processing fee of $5 per instrument on withdrawals, cancellations and return of excess contributions; and $50 per instrument in transfers to another eligible institution. A fee of $50 may apply to deposit instruments that are subjects to a judicial or governmental order (including but not limited to the Department of the Treasury and the Internal Revenue Service). Banco Popular offers several investment alternatives. Obtain more information to determine which one is best for you and consult with your financial advisor. The Mutual Funds IRA are not bank deposits, not guaranteed by Banco Popular, not insured by the FDIC. There is a possible risk of loss of principal. Certain fees and restrictions apply.